Take the yeast in a glass and mix it in the milk adding a tbspoon of sugar to it and keep it aside for 10min. 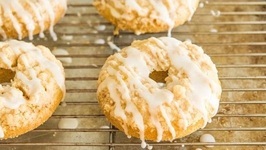 Take the flour, 1/3 cup sugar and salt in a bowl. Add the risen yeast and vanilla essence to the flour mixture and knead it gently till you get a smooth and very soft dough. Now add the softened butter and knead gently for 3 more min. Now keep it aside for rising for 30min to 1 hr, by covering with a kitchen towel or plastic. Once the dough has risen to double its quantity,knead it lightly again to take out the air. The dough would be little sticky at this stage, so keep extra flour handy as you may need to add some while kneading. Now dust the rolling pin and the rolling surface with flour and roll out the dough till 1 cm thickness. 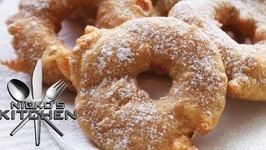 Keep the cut out doughnuts on a flour dusted plate for rising for another 30min. 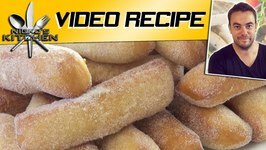 The remaining cut up pieces of dough can be kneaded lightly and again rolled out for making more doughnuts. 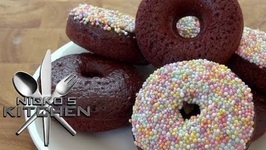 These doughnuts need to be covered with plastic or a moist kitchen towel for rising. But make sure the towel is not in touch with the dough. 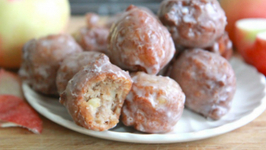 Once the doughnuts again rise to double its size, it is ready for deep frying. The oil has to be heated in a deep bottomed pan. 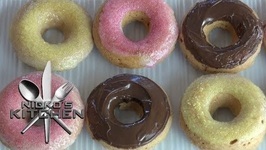 But once the oil is heated the flame should be reduced, if not the doughnuts may brown on the outside but remain uncooked inside. 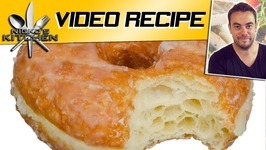 Test the oil by dropping in bits of dough. 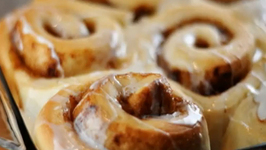 If the dough floats immediately after immersing, it means the heat is right. 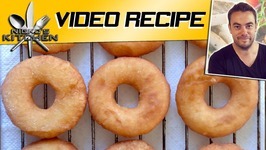 Now gently immerse the doughnuts into the oil one after the other. 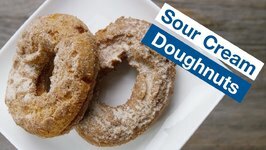 If the dough has risen enough, they would float immediately in the oil. This acts as an indicator. 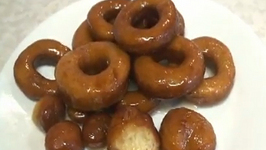 Fry the doughnuts on a medium flame till it is golden brown by constantly flipping them over. 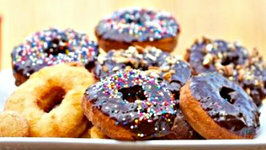 Once the doughnuts are fried, keep them on tissues for getting out the excess oil. 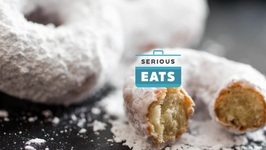 These doughnuts now can be rolled on powdered sugar and kept aside for cooling. 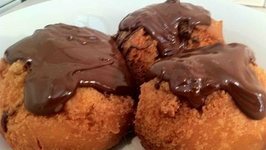 For chocolate glazed doughnuts, melt some chocolate in a double boiler or in a microwave on 40 power for 3min, or till melted. 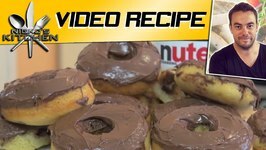 Spread this melted chocolate on the cooled doughnut using a spoon. Keep aside for the chocolate to set. 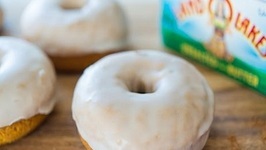 For sugar glazed doughnut, take 4 tbsp butter, 2 cups icing(powdered sugar) and dissolve it in 2 tbsp water or milk. Add vanilaa assence and mix well. 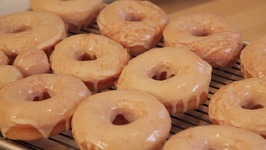 Dip the cooled doughnuts in this sugar glaze and keep aside till the glaze sets. 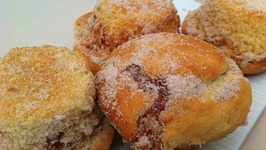 Eat them while warm and ENJOY! 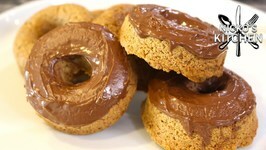 For doughnuts that are stored in the refrigerator, heat them in a microwave on High for 20 sec. Then they will as soft as ever for consumption. 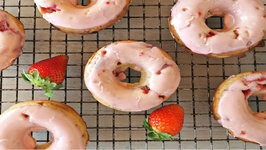 You can play around with toppings. 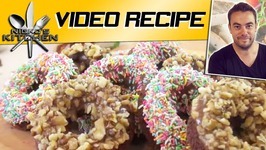 Make chocolate doughnut, sprinkle some great looking candies, coconut, or chopped nuts and enjoy!